One Vision Imaging is a producer of wall display products, albums and framed goods with customer base in the UK and abroad. The company experienced significant damage in transit to high value framed sporting memorabilia. International transit was proving particularly troublesome – on average 10% of products were being returned. 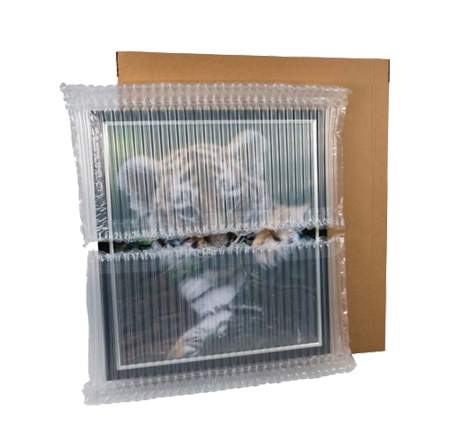 Network Packaging, part of Macfarlane Group, worked closely with One Vision Imaging to develop a new, bespoke packaging solution for transporting large frames. They suggested the use of Airsac inflatable packaging and designed new impact absorbing endcaps for improved protection. The new solution has helped One Vision Imaging reduce product damage in transit and returns to less than 1%. The company has also benefited from reduced reverse logistics costs and improved efficiency, allowing them to dispatch goods quicker than before. The new packs provide better customer experience, facilitating transaction processes, and are 100% recyclable.